Robert Redford stars as an older man alone, on his failing boat, in the middle of an ocean. Survival would take a lot in ingenuity and hope. I've never seen a movie quite like 'All is Lost' before. There's hardly any verbalizing for a start, and certainly no dialogue. On less than a handful of occasions, Robert Redford's unnamed character utters a one word exclamation in response to some new threat. Once it's a very heartfelt (and long overdue) swearword. Instead this survival movie relies upon Redford's facial expressions and actions to propel the plot along. You quickly realize that he is an amazing actor. Something I'd totally missed before I saw this film. Robert Redford was seventy-six years old when he filmed 'All is Lost'. He doesn't play it as a younger man either. Normally action and adventure movies are about young men (and sometimes women too) rushing around, pulling off feats of strength and timing to save the day. If the actor is a little past his (or her) prime, then they act as if they're about twenty, and hope that nobody notices their laughter lines. Robert Redford didn't bother with any of that. He played his role as a 76 year old man (though we're never told how old his character actually is). Nor was this portrayal lined through with zimmer frames and dementia. It wasn't there to mock the elderly. All is Lost shows us precisely what older men are capable of doing. It's chock full of action, but occasionally the obvious solution may be thwarted by the fact that Redford hasn't the strength that he might once have enjoyed. The peril is heightened by the need - after pulling off a desperate but necessary feat for survival - to have a little rest to catch his breath. Redford's character is very fit for his age. He is not at all in his dotage, but neither does he attempt to act like a teenager either. When his body fails him, the boatman diverts his energies into cerebral solutions, mining his experience or using tools to achieve his ends. He's so good at it that the pace never falters and you forget that no-one's spoken throughout the movie. It's a clever performance riding a tidal wave of adventure, as everything that could go wrong does go wrong, until all is indeed lost. All is Lost is about a man taking to the oceans on his yacht. There is family at home. He addresses a letter to them, when he knows he's not going to make it, and we glimpse a card enclosed in one of his cases from someone beloved. But generally they do not feature at all. 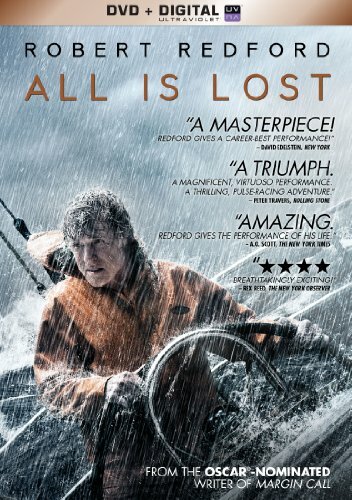 All is Lost isn't here to tug on the heart-strings. It's a movie about one man taking on all that nature can throw at him, while doing his best to simply survive. His issues begin when his yacht collides with a storage tanker - no doubt dropped from some passing ship. A hole is ripped into the side of his vessel, pouring water straight over his radio and navigational equipment, as well as rendering useless some of his food stock. 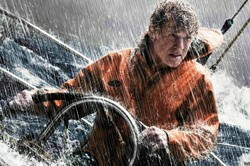 Equal to the task, Redford's character is able to patch up his boat. All could have so easily have been well here, but the yachtman's inexperience opens up a whole new world of danger. It's never stated, but implied through the mistakes that he makes, that the man hasn't spent his entire life on the ocean. My guess is that he retired, bought a yacht and takes voyages for the peace and quiet, or because it was a long-held dream to accomplish. He doesn't, for example, know how to navigate without all of his electronic equipment. Now that's ruined beyond repair, he quickly has to consult his books and teach himself how to use a sextant and compass. Only that takes time, and he's unwittingly sailing straight into a major storm while he reads. The next eight days are going to severely test his will and ability to survive. Robert Redford won the Best Actor Award from the New York Critics' Circle for his performance in All is Lost. I can certainly see why. Without dialogue, all of his emotions had to be conveyed through his looks and actions. He did it in a very understated way, often patient and cautious, yet nevertheless left us in no doubt as to his feelings. He also performed all of his own stunts in the movie, which wasn't without cost to himself. At the Cannes Film Festival, in 2013, Redford strained to hear a question posed by a journalist. He revealed that he'd lost the hearing in one ear, while subjected to the strain of acting in All is Lost. It's a performance well worth watching. They are amongst some of the biggest names in entertainment, politics or the news, and these celebrities are deaf in one ear. Find out who they are and how it happened. 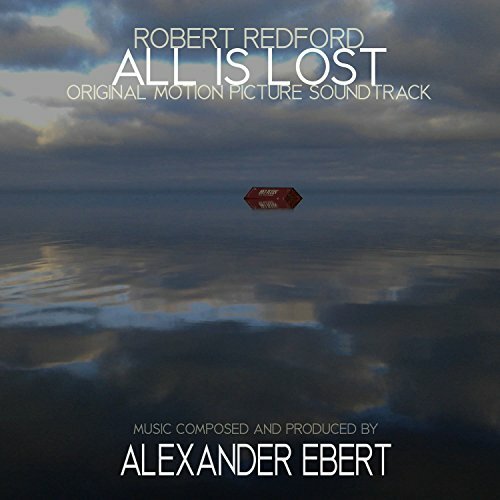 Composer Alexander Ebert won a Golden Globe Award for Best Original Score for his work on All is Lost. The frontman of Californian band Edward Sharpe and the Magnetic Zeros used the elements as his inspiration for his music. After all, the yachtman is exposed to wind, rain, ocean, sun and storms during the course of his adventure. This was the first time that Ebert had scored a whole movie, though his songs had featured amongst the soundtracks for Fright Night and Curfew. I didn't really expect it to, and sometimes I think we can cut a movie a bit of slack though. I always end my movie reviews by checking it against the Bechdel Test. But I feel a little mean about doing it here. The Bechdel Test assesses the role of women on the silver screen. It sets an unbelievably low bar, wherein a pass requires just two named female characters, who have a conversation with each other, and the subject isn't a male character. 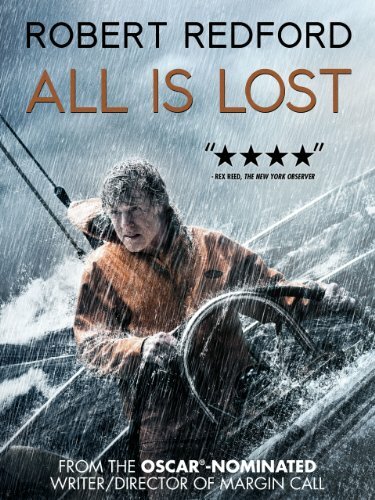 All is Lost fails on all counts, but it was a movie about a man on his own. Redford's character could have been swopped entirely with a female, and it would still have failed the Bechdel Test. I really don't blame it for that. Ah! You know I nearly guessed at that! Soooo close! Water resistant make up - No? Something about resisting water if necessary? I suppose that it could be viewed as a grounding thing. The world has gone to pot, but I can still make myself presentable to meet it. Thus I will meet it. I haven't seen the film yet - but I agree that shaving would be vitally important. It means there might be a 'tomorrow', hope, etc. It's keeping him in touch with himself and his routines too. As for make-up: Yep, I would put some on in case I got rescued by a load of sailors....and I don't even go to put the rubbish out unless I have my slap on! I don't know. I think that the imperative to survive in strong in us all. Let's hope that we never get to find out! Jo - Yes, it really has kept me thinking. I'm now a week or two down the line after watching it, and I'm still contemplating scenes. Putting on make-up would be a great analogy. Maybe it's a bravery thing? I have friends who could take on Hell and high water, if they're wearing their 'face'. And that's precisely what needed grasping here. Frank - The Bechdel Test has huge limitations, even within the context in which it was created. There are some movies with really strong female characters which fail it - The Hunger Games only just scraped through - while it doesn't really work as a test in movies like this. Unfortunately, it's the only quick and pat litmus test out there. LOL I love that you ran with my flippant comment about shaving. That was my only 'huh?' moment in this film. To be fair, none of the men in my Skype call could understand why he might stop and shave then too. Perhaps you'll have more insight, when you see the scene in context. As for the film itself, I think you would love it. I couldn't at all identify demographically with the central character, yet he held me rapt throughout. The reason I empathized his age was solely because it's so unusual for a film like this to cast an older man, and to allow a 76 year old actor to act like he's 76, without also rendering him doddering or infirm. Closely based on a true story, a young family are holidaying in Thailand during the tsunami disaster of 2004. Separated, the survivors hunt for their loved ones. Peter Jackson is back with the first of a series of Lord of the Rings prequels. Will he be true to Tolkien or will we be Jar-Jarred by The Hobbit?